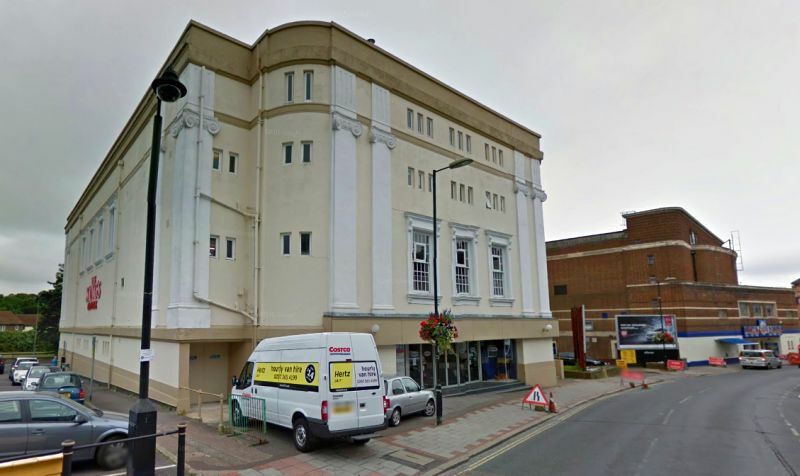 The Empire Theatre was built for the Empire (Aldershot) Ltd., primarily as a Cinema but it did also have a large stage and its own Compton Organ 2/6 on a lift. The Theatre was designed by the architect Harold S. Scott and built next door to the future Ritz Cinema, on land which was previously occupied by the Royal Engineers, and opened on the 1st of August 1930. The auditorium was built on two levels, stalls and one horse shoe shaped balcony and had seating for 1,599. In 1931 the Theatre was taken over by the County Circuit and by 1937 the capacity had been reduced to 1,458 seats. The Organ was removed in 1959 and taken to the Gorleston Palace Theatre. The Theatre was eventually renamed the Odeon on the 18th of January 1964. This should not be confused with the Odeon on Barrack Road which was formerly the Alexandra Music Hall, or the Odeon on the High Street next door to the Empire which was formerly the Ritz. The Odeon, High Street, formerly the Empire Theatre, closed on the 17th of October 1981 and the building was later taken over by a Christian organisation and called The Kings Centre. The former Theatre and Cinema was bought by the Property Company HPS in 2015 who planed to use the building as an entertainment venue hosting concerts, shows and exhibitions.